Seriously, ain't she a beaut?? You must know by now I've become absolutely engulfed by Little Black Bag. The online shopping/trading site has completely consumed me, but it's okay! I'm still in control of my life. Really. I swear. 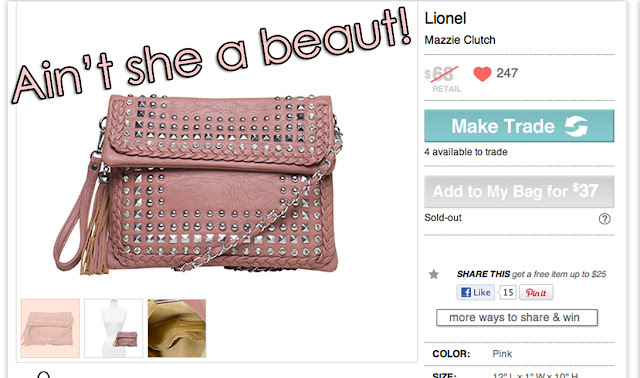 Last week Little Black Bag released the Lionel Mazzie Clutch in lipstick pink, and everyone went BER- FREAKING-SERK! The bag sold out in 3minutes! I was an idiot and thought it would be a bad idea to simply "Add to Bag for $37". Needless to say, I completely missed out! I tried to pretend like I didn't care. Like I didn't want it. Like an adorable pink bag with even more adorable studs just wasn't a big deal. BUT THEN IT ATE AWAY AT ME!! I wasn't going to open a new bag for February after finding out about the ludicrous customs/tariffs charged on the items I ordered from LBB on my last order (I'll go into detail about this some other time), but I just could NOT resist. I HAD to open a bag to try to trade for the pink Mazzie! The trades on this hot item was CRAY-ZAY. NO ONE, and I mean NO ONE, wanted to give this baby up without a fight. The story of how I ended up with it is a long one, and I don't want to bore you all to death. But in the end (after MUCH effort) a lovely lady (Chic Chick) agreed to trade it to me. 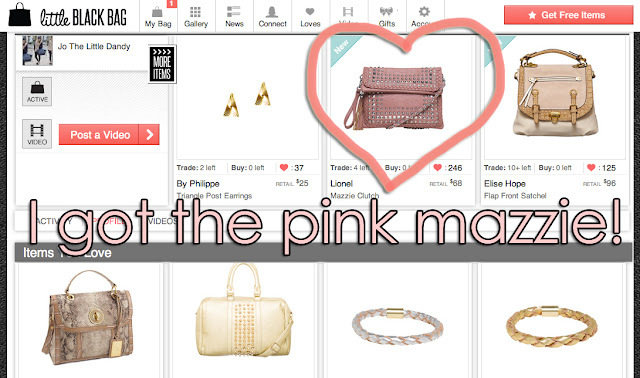 I was over the moon with pink-mazzie-clutch-happiness! I still have about 4 days left of trading before my bag ships, and I am SOOOO excited to wear this clutch for spring/summer! So much so that I've put together the below image for some style inspiration! What do y'all think? Incredibly cute, right?? Ahck, I'm so excited! Hehe. Anyway, you can check out my very first LBB unboxing video below. I also have my second January LBB currently in the mail on it's way to me =). Hope you've all had a wonderful weekend! I'll have an outfit post up soon my lovelies! Thanks for reading =). I love the kitty shirt. I bought the pink Mazzie from a gal in the trading group. It should be her tomorrow ! Congrats on yours !